Sheet Pan Meal Prep 2 Ways (again! )- the easiest and most efficient way to prep multiple meal prep lunches at the same time is to use your sheet pans! These pesto chickpea pita pockets and Thai chicken lunch bowls are ready in under 45 minutes and give you two different lunch options to enjoy through the week. Do these recipes sound familiar? Well that’s because they are not exactly brand new recipes. These Thai Chicken Lunch Bowls were one of my first ever meal prep recipes and have been pretty popular around here. And last January I posted these Pesto Chicken Pita Pockets, and have been obsessed with how easy and tasty they are ever since. 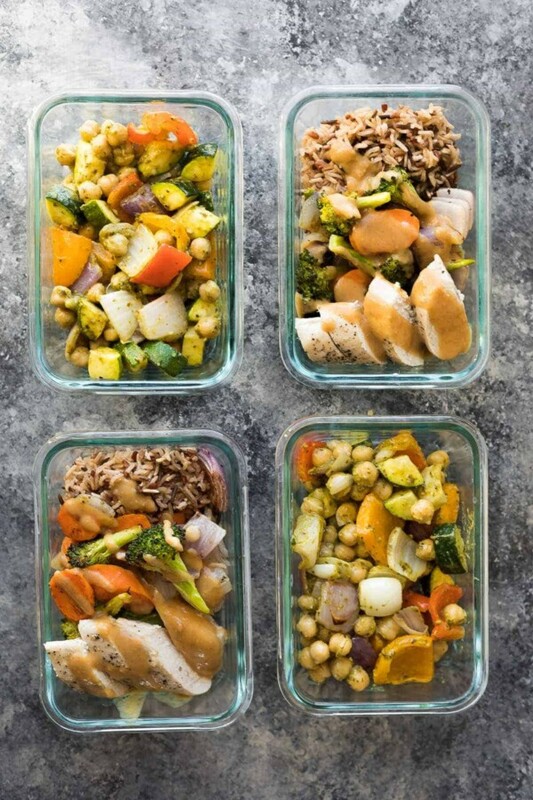 But today I’m showing you how you can prep both of these meal prep lunches at the same time, to get some variety in your meal prep lunches through the week. 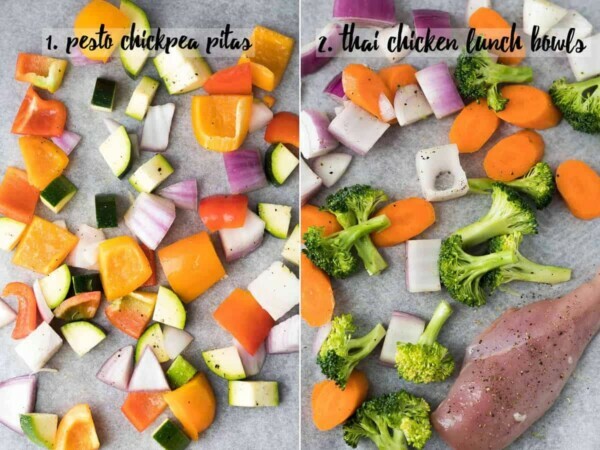 If these sheet pan meal prep recipes look familiar, well, you may have participated in our January 2018 Lunch Prep Challenge. Want in on our next challenge? Sign up below! Using a sheet pan is one of my favorite ways to meal prep, because it’s just SO hands off. 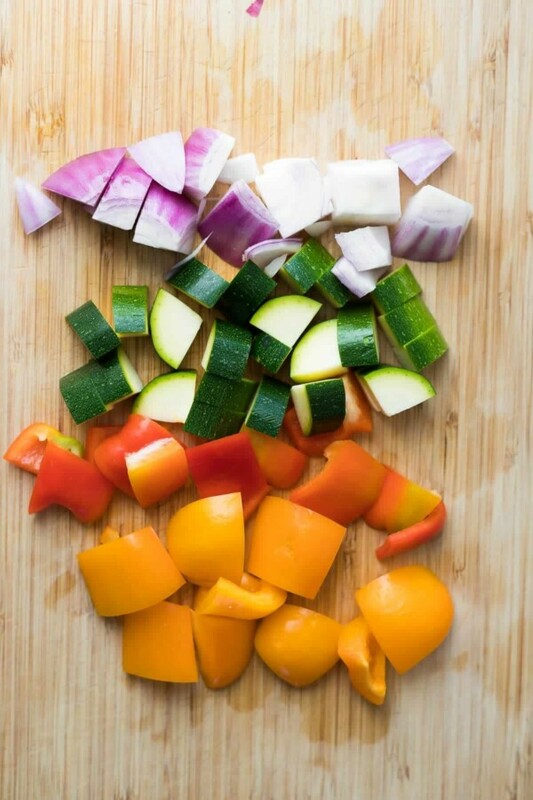 Toss your veggies and chicken in some olive oil and toss them in the oven. You have your hands and mind free to prep a sauce, some grains, or whatever else you might need for your prep. You can spice up your sheet pan meal preps using a variety of spice rubs (have you seen this post with 7 different spice rubs?) or a sauce. I like to start by cooking my grains (rice in this case for the Thai chicken lunch bowls). Next I chop up all my veggies. You will drizzle your Thai chicken lunch bowls with the peanut sauce, and you will toss your pesto chickpea pita pocket filling with a couple of tablespoons of pesto before portioning it out. Voila! Two different meal prep lunch options in under 45 minutes. Not bad at all! Pesto chickpea pitas: Toss the zucchini, bell pepper and onion in olive oil, salt and pepper. Arrange on baking sheet #1. 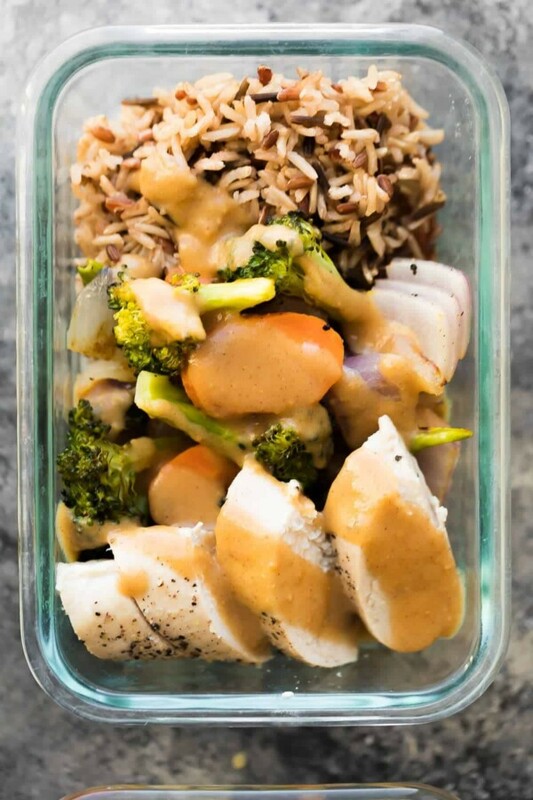 Thai chicken lunch bowls: Toss the chicken breast, broccoli, carrot and onion in another tablespoon of olive oil with salt and pepper. Arrange on baking sheet #2. Bake for 15 minutes. 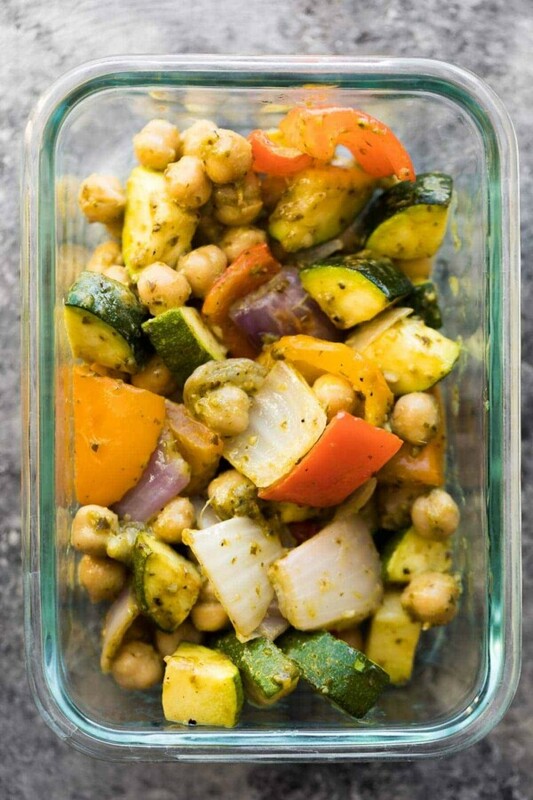 Remove the pesto chickpea pita sheet pan and allow to cool. Stir up the Thai chicken lunch bowls veggies, flip the chicken and return to the oven for 10 more minutes. While everything is baking, shake or stir together the peanut sauce ingredients. Pesto Chickpea Pita Pockets: toss the veggies with 1 cup of chickpeas in two tablespoons of pesto, then divide between two 2-cup capacity storage containers. Thai Chicken Lunch Bowls: Allow the chicken to rest for 10 minutes before slicing. 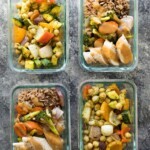 Divide the quinoa, veggies and sliced chicken between two 2-cup capacity storage containers. Drizzle with peanut sauce. Pesto Chickpea Pitas: heat the filling gently, then spoon into pita pockets (don't cut the pitas until just before serving. Thai Chicken Lunch Bowls: heat in the microwave, then spoon into a tortilla or wrap.